Troop 41 of Hamilton is again under the sponsorship of the Hamilton Kiwanis club, with Max Matice, whose work the past year has been responsible for the fine showing of the troop, as scoutmaster. 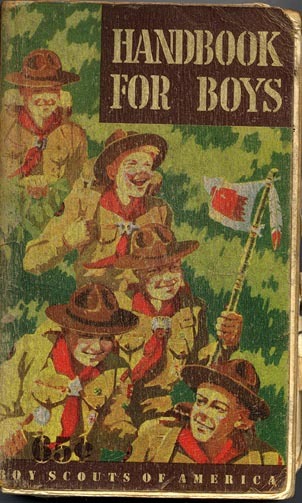 The troop meets weekly in the Scout room of the city hall. Advancement thus far has been excellent, the outdoor program successful. Boys Life magazine was subscribed to 100 peer cent. OFFICIAL ROSTER -- Danny Barden, Mike Bricker, Larry Coffman, Thomas Coulter, Dennis Dadant, Billy Gray, David Grout, Stephen Grout, Terry Hambelton, Billy Harris, Richard Hawley, Terry Inman, Phil Jackson, Douglas Monson, Bruce Ohms, Jerry Perkins, Tommy Ross, Allan Smullling, Raymond K. Symmonds, Bob Wells, Larrie Daugherty (sp), David Dun, James Brady, Edwin Lee Conover, Larry McKemson (sp), Jimmy Lee Taylor, Leslie R. Williams, Donald Taylor, Gary Myers. Note: The names listed in the official roster do not match the picture. Two names marked as (sp) errors are on the edge of deteriorating paper. 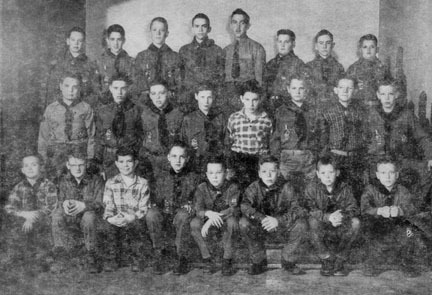 The Scout room mentioned above was in the far end of the basement in city hall. This was a good, tucked away environment for boys to meet and learn their scouting skills. At the other end of the basement were two holding cells, (the town drunk tank). Although off limits, we would at times sit in a cell to feel what it would be like. That was excellent deterrent training. Game time would run the gambit from kick-the-can in the summer to bobsled riding while being towed behind a jeep over snow covered streets in the winter.